Ruth Handler, left, created the Barbie doll in 1959. She and husband Elliot Handler were co-founders (with Harold Matson) of Mattel Inc. / Photo from Mattel Inc.
You know the old joke about turning 60: Your broad mind and narrow waist have traded places. Mattel's fashion doll turned 60 on March 9, and she is just as svelte as ever with a face still wrinkle-free. She hasn't aged a day since her debut in a perky ponytail and black-and-white striped swimsuit at the American International Toy Fair in New York in 1959. The 60th anniversary Barbie dolls, released in January, come in Caucasian and African-American versions. Each sells for $60. / Photo from Mattel Inc.
Barbie Millicent Roberts (aka Barbie) has had more than 200 "occupations" over the six decades that the blonde bombshell has been building her brand empire. After her first job as a model in 1959, she moved up to fashion magazine editor (1960) and then became an astronaut (1965). With the introduction of bendable legs in the mid-1960s, she was ready to go for gold at the Olympics. Surgeon, veterinarian, stewardess, teacher, rock star, UNICEF ambassador, Sea World animal trainer — Barbie's career path has only been limited by the imaginations of the children playing with her. And inspiring girls to think beyond stereotypical female roles is why Ruth Handler created the doll. Handler has been quoted in numerous interviews as saying she watched her own daughter limited by the toy choices (primarily baby dolls) of the 1950s. "The only role she could imagine through that play was caregiver or mother," Handler recounted, whereas her son could play he was a cowboy, pilot or doctor. So Barbie was introduced as an independent young woman who could pursue any career — a novel concept for that time. "They discovered when Barbie came out that girls quit playing with baby dolls," says Carolyn Cronan, vice president of the Chattanooga Doll Club. Cronan has been a Barbie collector for 45 years and has amassed a collection of 2,000 Barbies. "Barbie sold for $2.98 (when she first came out.) Now an original Barbie in mint condition with the original box goes for $6,000 to $8,000," she says, adding "the vintage clothing is worth as much as some of the older dolls." Barbie rivals Madonna in the number of times she has reinvented herself: blonde, brunette, redhead, slender, curvy, black, white, tall and petite. After the doll came under fire for her unrealistic, voluptuous body and the message that sent young girls, Mattel responded by unveiling three new body types in 2016 with a variety of skin tones, eye colors, hairdos and hair textures. And Mattel isn't through with her yet. In February, USA Today announced that Mattel will debut a doll this summer that uses a wheelchair and a doll with a removable prosthetic leg as part of the Barbie Fashionistas line. Mattel reports that a doll with a wheelchair accessory has been one of its most-requested items. The doll, wheelchair and compatible DreamHouse ramp are expected to sell for around $20. 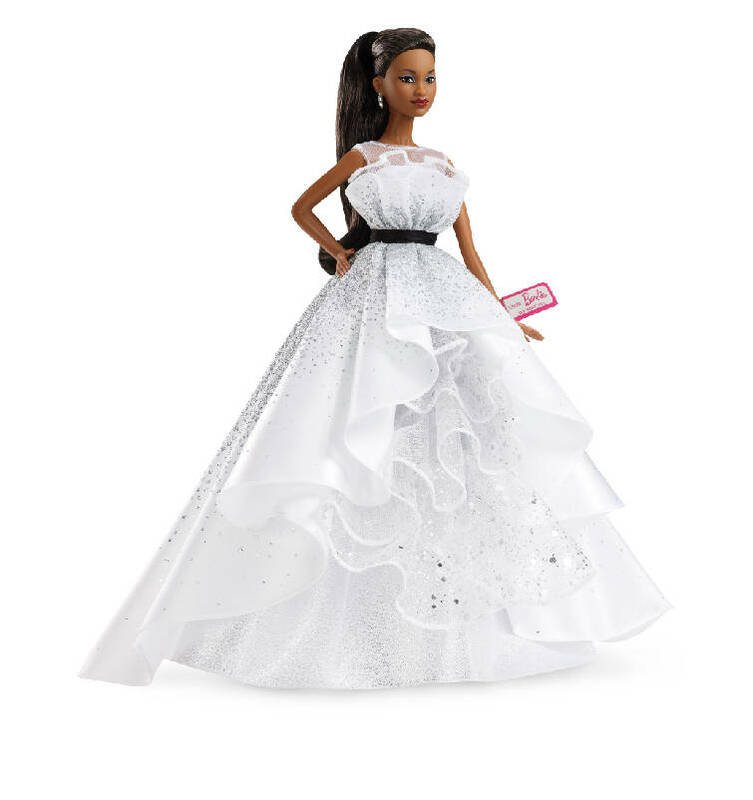 In honor of Barbie's 60th birthday, an anniversary doll was released in January in Caucasian and African-American versions. Looking eerily similar to Gwen Stefani, the Caucasian doll has a high, platinum ponytail. 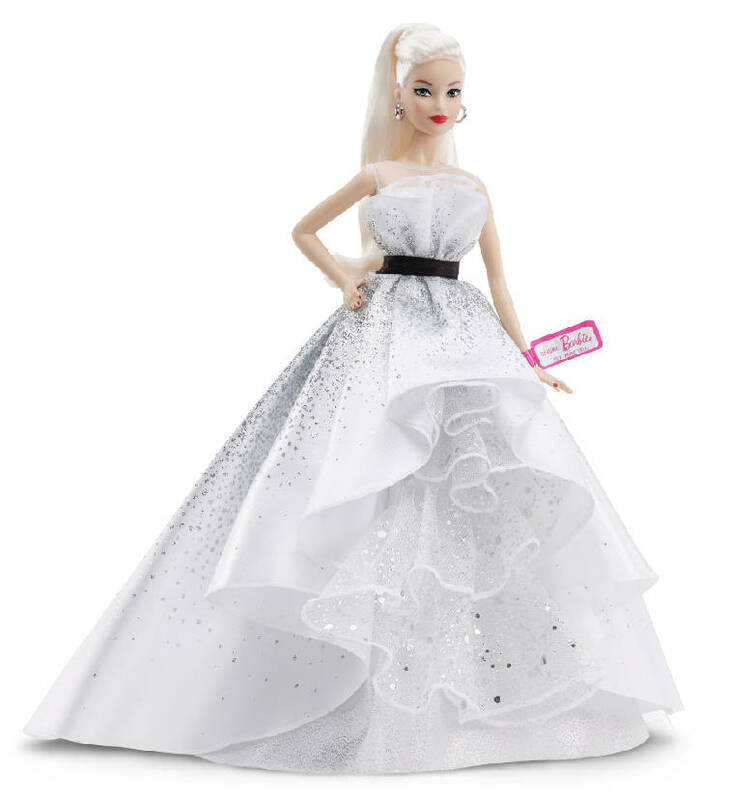 Both dolls wear hoop earrings, a cascading white ballgown with silver twinkles, black heels and wrist tag that makes them ideal for collectors. It will sell for — what else? — $60.